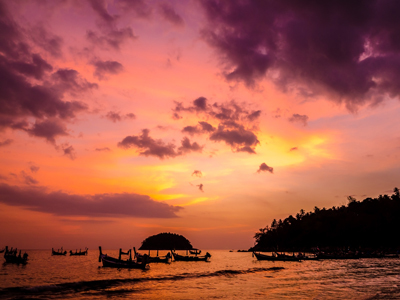 This custom Thailand honeymoon includes a wide range of cultural and adventurous activities and explores many of the highlights and hidden gems of this amazing country. There is something about these countries that is undeniably enticing; the balmy, tropical weather creates a soothing and relaxing atmosphere, the aromas engulf your senses, the local people charm and welcome you, and the cuisine is a delicious blend of cultures that is undeniably Thai. Meet your guide after breakfast and head to Wat Po, one of Bangkok’s oldest and largest temples – famous for the 43 meter long reclining Buddha. Visit Lak Muang, Bangkok’s city pillar, before heading to the famous Grand Palace. See the Temple of the Emerald Buddha (Wat Pra Kaew), the most revered shrine in the Kingdom. Enjoy lunch at a riverside restaurant before boarding a longtail boat to explore the klongs, Bangkok’s maze of canals and waterways - see parts of Thai traditional life which have disappeared from most of Bangkok. 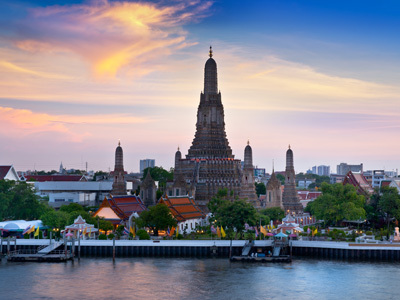 End the day with a visit to Wat Arun, the Temple of Dawn, before continuing to China Town for a private Chinatown Foodie Walk and Cultural Tour. 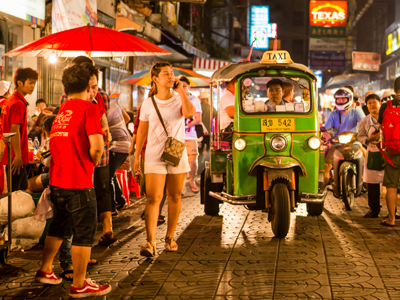 This tour allows you to discover the sophisticated flavors of Bangkok's 200-year-old Chinatown district that is filled with rich ethnic traditions and delicious food. During the tour you will explore and taste local cuisine from seven famous eateries, varied from street food vendors to renowned fine dining restaurants. Between each tasting location, you will take a behind-the-scene adventure for a closer look of this unique neighborhood, meeting the food bazaar’s lively characters, hearing its memorable stories, and visiting religious and cultural landmarks. In the morning, you will be picked up at your hotel in Bangkok and transferred to the airport in good time to board your domestic flight to Chiang Mai. 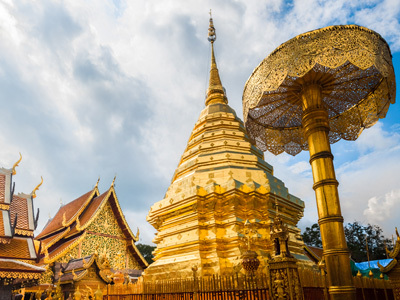 On arrival in Chiang Mai at 1:25pm, you'll be met by your private guide and driven to what is probably Chiang Mai's most famous landmark—Wat Prathat Doi Suthep, the temple located on the 1676 high Doi Suthep. Climb the 300-steps staircase, flanked by Nagas, or take the cable car up. With clear weather, the sunset views are incredible. You will be picked up from your hotel at 7:30 AM this morning, for an unforgettable experience at the Patara Elephant Farm, located just outside of Chiang Mai. Upon arrival at the farm, you will change into traditional mahout outfits. Once you look the part, you will be given a short briefing on how to handle the elephants, before heading into the bush to find them. On this full-day experience, you will learn all about the elephant farm management and their breeding program. Enjoy your first encounter with these gentle giants, as your guide teaches you how to approach and interact with them. After feeding the elephants, you will walk them to the river, to join in their morning bath! You will be taught the different commands and techniques that the mahouts use to communicate with the elephants. A 15 minute drive out of Chiang Mai leads you to a traditional Lanna family, continuing the traditions of many generations in building their homes of teak wood and maintaining the natural surroundings in a way now rarely seen in Chiang Mai. Use traditional home recipes with authentic Northern Thai flavors that are different from standard dishes offered in commercial cooking classes. Select fresh ingredients from the garden to add to today’s cooking extravaganza. 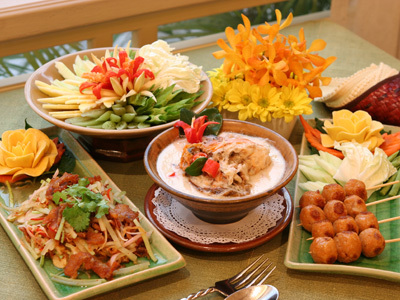 Take full advantage of the opportunity to get to know a real Thai family, be their house guest for the day and enjoy a delicious home cooked lunch with them. You will be picked up at 7:30am for the daytrip to Doi Inthanon National Park, the highest mountain of Thailand (2776 meters). The park boasts the greatest diversity of forest types and bird species found in the entire country and has some beautiful waterfalls. 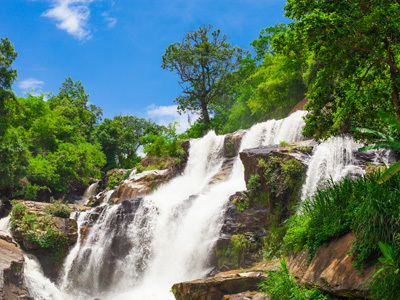 Visit the Mae Ya and Vatchirathan waterfalls on a walk through this un-spoiled cloud forest. On the way to the summit of Doi Inthanon learn about the agricultural techniques of the hill tribe people at the Royal Project of Baan Khun Glaang. Tour includes a scenic picnic lunch. Return to Chiang Mai arriving back at your hotel around 6:30pm. This morning, you will be picked up at your hotel in Chiang Mai and transferred to the airport in good time to board your flight to Phuket. 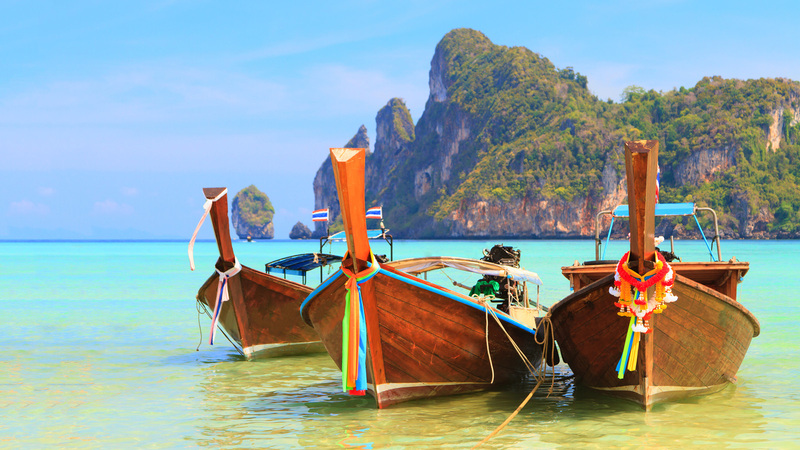 Upon arrival in Phuket you'll be met by your driver and transferred directly to your hotel. Enjoy the day at your leisure. Enjoy this full free day at your leisure! This morning you will be picked up around 8:00 am from your hotel's lobby and transferred to the Royal Phuket Marina pier. 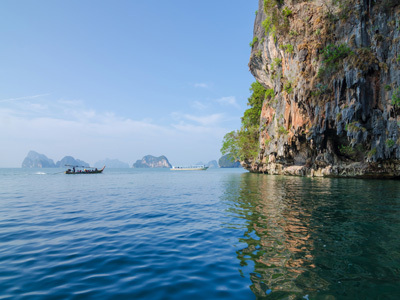 Around 9:00 am, your speedboat will depart from the pier to Phang Nga Bay. Then you will arrive at Hong Island where you will paddle and explore Hong Island by sea canoe. Continue for trekking and sightseeing at James Bond Island. Next head to Mangrove Cave & Diamond Cave at Panak Island. Explore the Mangrove Forest. The day will be free to rest and relax at your leisure (Late check-out is included until 6:00 PM). At the appropriate time your driver will arrive at your hotel to transfer you to the Phuket airport for your departure flight to Bangkok. 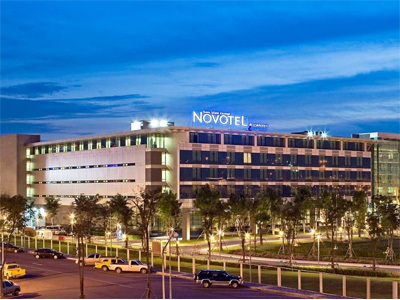 Upon arrival in Bangkok, proceed to the arrival area and look for the Novotel Suvarnabhumi’s hotel representative. He/she will direct you to the hotel’s complimentary shuttle service. The shuttle picks up outside, between Gates 4 and 5 on the arrival level, and departs every 10-15 minutes. Alternatively, access the hotel from the airport’s main terminal via the 200-meter, air-conditioned underground walkway. This morning, return to the terminal to check in for your international flight departing at 7:04 AM (DELTA 284). You may access the terminal via the hotel’s complimentary shuttle or underground 200-meter, air-conditioned walkway. Upon departure from the hotel, guests can contact the Concierge to ask for the shuttle service. This shuttle service is available 24 hours. The elegant COMO Metropolitan Bangkok invites you to enjoy an urban escape nestled within the central business district of Sathorn. This sleek, contemporary property embodies style and grace. The hotel is idyllically located between the river and the Sukhumvit District, just 10 minutes from Silom’s buzzing nightlife scene. Convenient access to the nearby BTS Station and MRT train networks, offers the perfect base from which to explore the wonders of Bangkok. The hotel combines passionate service with award-winning cuisine and exquisite attention to detail, promising a memorable experience. 137 Pillars House revives the old world elegance of the Orient and invites guests to enjoy every modern luxury. This home-style residential concept allows visitors to participate and share in the richness of a likeminded international community while creating plenty of space for sublime intimacy in sumptuous suites and throughout tropical grounds. Architectural historians and conservationists worked meticulously to reinforce the integrity of the original 1889 structure at 137 Pillars House. Guests can expect the same nostalgic ambience in all 30 suites, along with the latest modern comforts and conveniences. 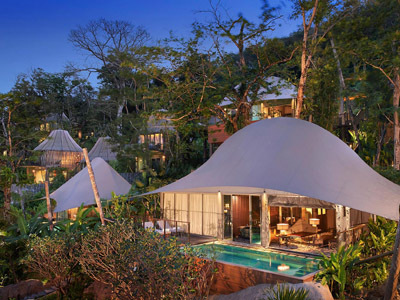 Hidden far from the crowds, the fascinatingly unique Keemala Resort sits on a hillside, overlooking the Kamala Village and the Andaman Sea. Surrounded by lush woodlands, Keemala offers a retreat from every day life and welcomes you into an enchanting evergreen wonderland. The focus of the property is to offer experiences that enhance your quality of life. 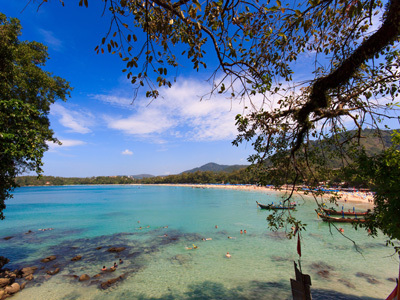 The resort is close enough to Kamala Beach, the liveliness of Patong Beach and all the vibrant action that Phuket has to offer, yet far enough removed, that you can easily step back and take time to enjoy the tranquil surroundings of the rainforest and a plethora of holistic activities and cuisine to aid well being. Representing the only official airport hotel, Novotel Bangkok Airport features 612 rooms and suites, designed with an intriguing Thai influence and a complete understanding of guests’ needs. This property is the only one situated directly next to the airport terminal. Enjoy convenient hotel access with either a leisurely 5 minutes stroll via the air-conditioned underground walkway or a short ride in the 24 hour complimentary airport shuttle service from gate 4 at the arrival level. The hotel also offers an abundance of facilities, including 7 restaurants and bars, a luxurious spa, a swimming pool surrounded by tropical gardens with a pool bar, a well equipped fitness center with a sauna and steam-room and a business center.